1. Lown B, Axelrod P. Implanted standby defibrillators. Circulation 1972;46:637-639. 2. Mirowski M, Reid PR, Mower MM, et al. Termination of ventricular arrhythmias with an implanted automatic defibrillator in human beings. N Engl J Med 1980;303:322-324. 3. Gregoratos G, Cheitlin MD, Conill A, Epstein AE, Fellows C, Ferguson TB Jr, et al. ACC/AHA guidelines for implantation of cardiac pacemakers and antiarrhythmia devices: a report of the American College of Cardiology/American Heart Association Task Force on Practice Guidelines (Committee on Pacemaker Implantation). 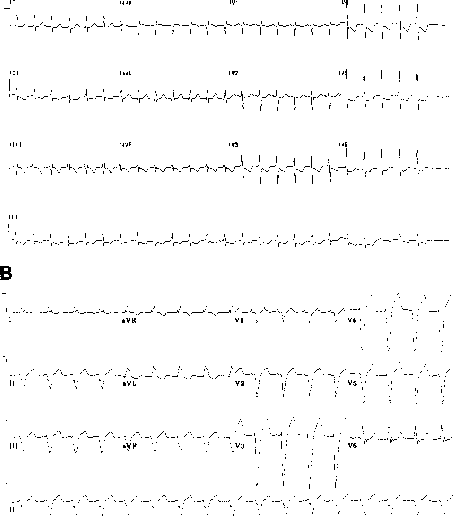 J Am Coll Cardiol 1998 Apr;31(5):1175-1209. 4. Antiarrhythmics versus Implantable Defibrillators (AVID) Investigators. A comparison of antiarrhyth-mic drug therapy with implantable defibrillators in patients resuscitated from near-fatal ventricular arrhythmias. N Engl J Med 1997;337:1576-1583. 5. Connolly SJ, Gent M, Roberts RS, Dorian P, Roy D, Sheldon RS, et al. Canadian Implantable Defibrillator Study (CIDS): A randomized trial of the implantable cardioverter defibrillator against amiodarone. Circulation 2000 Mar 21;101(11):1297-1302. 6. Moss AJ, Hall WJ, Cannom DS, et al. Improved survival with an implanted defibrillator in patients with coronary disease at high risk for ventricular arrhythmias. N Engl J Med 1996;335:1933-1940. 7. Buxton AE, Fisher JD, Lee KL, et al. for the MUSTT Investigators. A randomized study of the prevention of sudden death in patients with coronary artery disease. N Engl J Med 1999;341:1882-1890. 8. Bigger JT Jr. Prophylactic use of implanted cardiac defibrillators in patients at high risk for ventricular arrhythmias after coronary-artery bypass graft surgery. N Engl J Med 1997;337:1569-1575. 9. Trusty JM, Hayes DL, Stanton MS, Friedman PA. Factors affecting the frequency of subcutaneous lead usage in implantable defibrillators. PACE 2000;23:842-846. 10. Belott PH, Reynolds DW. Permanent Pacemaker and Implantable Cardiovertor-Defibrillator Implantation. In: Clinical Cardiac Pacing and Defibrillation, 2nd ed. W.B. Saunders Publications, Philadelphia, PA, p. 573. 11. Kutalek SP, Kantharia BK, Maquilan JM. Approach to Generator Change. In: Clinical Cardiac Pacing and Defibrillation, 2nd ed. W.B. Saunders Publications, p. 645. 12. Kroll MW, Tchou PJ. Testing of implantable defibrillator functions at implantation. In: Clinical Cardiac Pacing and Defibrillation, 2nd ed. W.B. Saunders Publications, p. 540. 13. Pinski SL, Simmons TW, Maloney JD. Troubleshooting antitachycardia pacing in patients with defibrillators. In: Estes NAM, Wang P, Manolis A, eds. Implantable Cardioverter-defibrillators: A Comprehensive Textbook. Marcel Dekker, New York, NY, 1994, pp. 445-477. 14. Pacifico A, Hohnloser SH, Williams JH, Tao B, Saksena S, Henry PD, et al. Prevention of implantable-defibrillator shocks by treatment with sotalol. N Engl J Med 1999;340:1855-1862. 15. Hayes DL, Strathmore NF. Electromagnetic interference with implantable devices. In: Clinical Cardiac Pacing and Defibrillation, 2nd ed., W.B. Saunders Publications, p. 939. 16. Epstein AE, Miles WM, Benditt DG, Darling EJ, Friedman PL, Garson A, Jr., et al. Personal and public safety issues relates to arrhythmias that may affect consciousness: implications for regulations and physician recommendations. A medical/scientific statement from the American Heart Association and the North American Society of Pacing and Electrophysiology. Circulation 1996;94:1147-1166. 17. Pinski SL, Trohman RG. Implantable cardioverter-defibrillators: implications for the non-electrophysi-ologist. Ann Intern Med 1995;122:770-777.